SO. 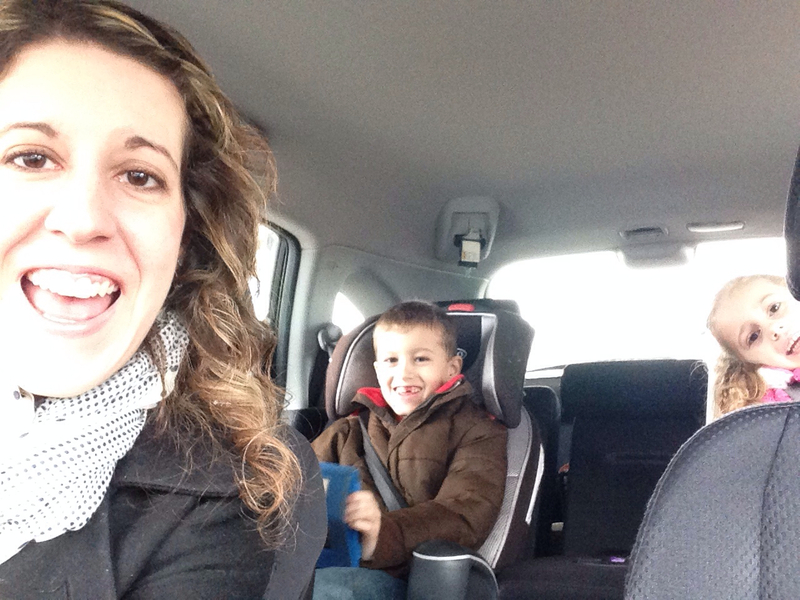 I took a mini bloggy break, because we decided to go on a little adventure in January during the polar vortex. Ok, well… it didn’t snow until we got back THANK GOODNESS. But, I wasn’t happy about the hour and a half commute to work on Tuesday after having such a blast on our trip. 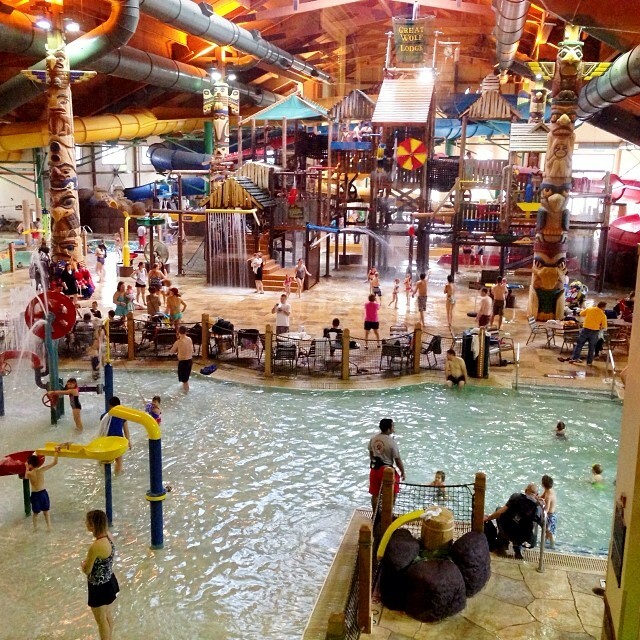 The kids did benefit from a snow day after our trip, which… lucky them. 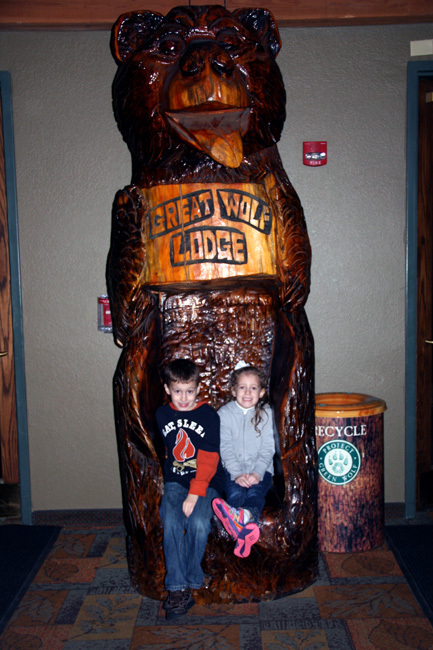 Anyhow, we went on a little trip to The Great Wolf Lodge in Kansas City, to celebrate something… something that… I can’t really talk about yet. Ugh. So, anyhow. It was A.W.E.S.O.M.E. and we are definitely going to make this a yearly tradition! This photo was taken at Quik Trip (QT) before we left from St. Louis to Kansas City and can you tell we are all just SO EXCITED?!!!!!!!!!!!!!!! Brian had to tap off the gas tank and I needed a French Vanilla cappuccino, my favorite drink of choice from QT. It also contains about 260 calories, so it is a drink I only treat myself to on VERY special occasions, such as THIS! And, I know. I really need to switch Nathan into a booster seat, I will soon… I am one of those over protective Moms, but I think it is time to finally make the switch. 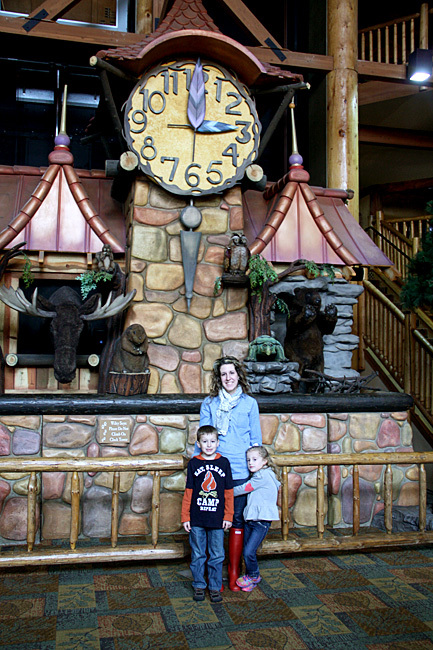 Great Wolf Lodge has 12 locations and we visited the Kansas City location, because it is the closest to St. Louis. It was a four hour drive, which wasn’t too bad since we stayed two nights. The lobby is very warm and inviting when you walk in… I think a lobby says a lot about the hotel overall and so if the lobby isn’t nice, I know I will be disappointed. 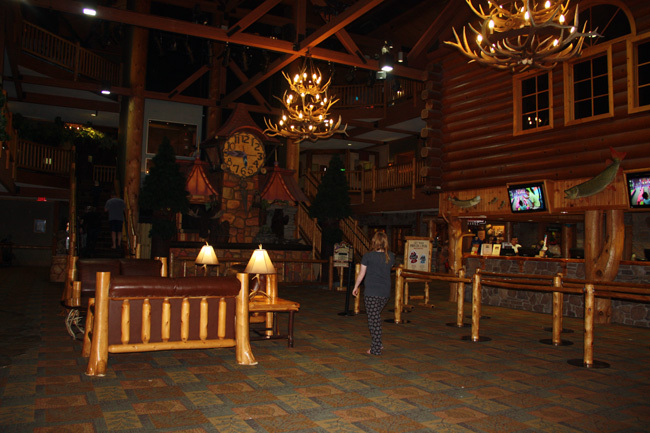 There was a lovely fire place, a clock tower to where they do a story time in the evening for the kids, open glass elevators, a view of the water park, etc., etc. 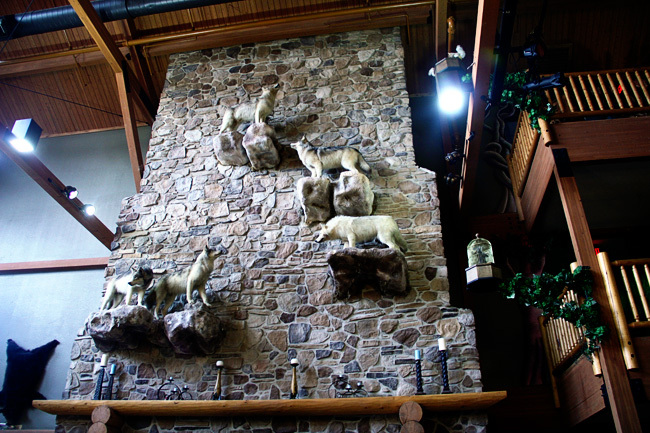 The only part of the lobby that was a BIT creepy was… the stuffed wolves. Eek. We did a lot of photos by the clock tower. 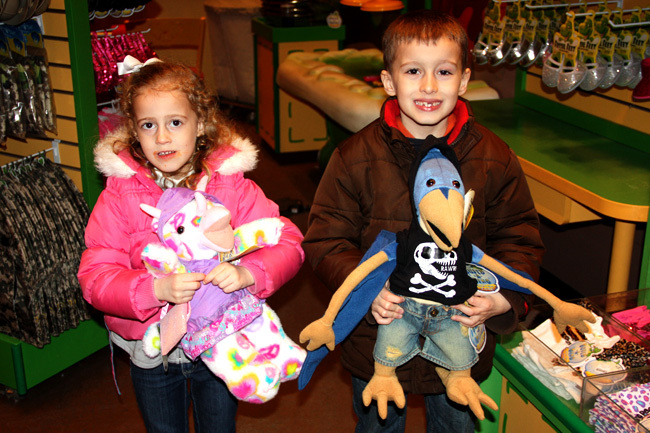 The kids were SO excited… I was too! 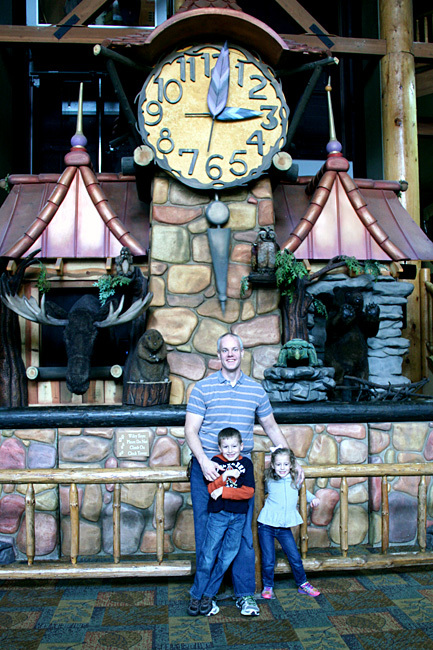 Brian with the kids by the clock tower. 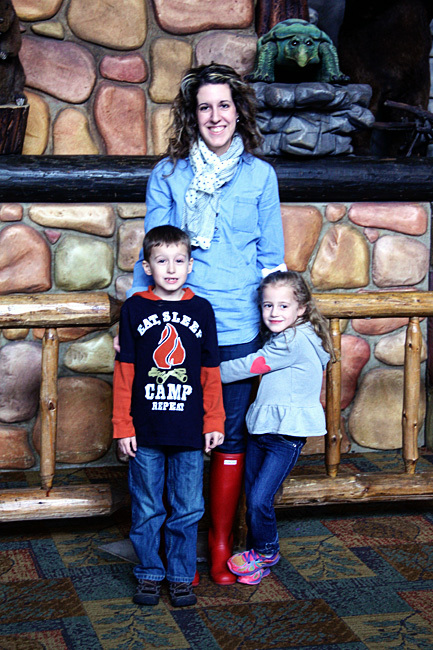 We really should have had someone take a family photo of us! Nathan wanted his photo taken with this wooden bear. After we checked in, we had a few hours before our room would be ready. 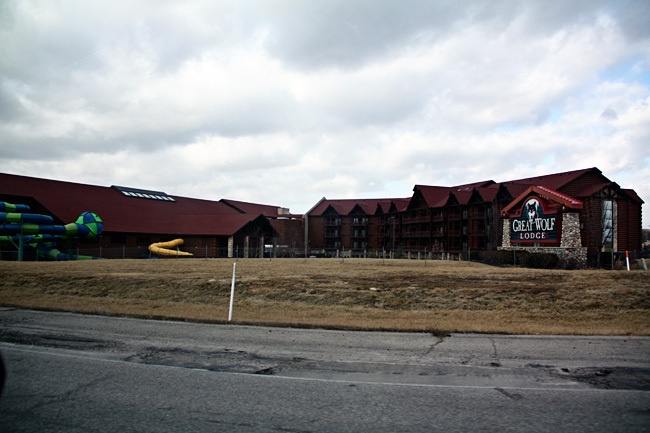 They let you enjoy the pool starting at 1 p.m. on check in day, but your room is typically not ready until 4 p.m. So, no problem! We enjoyed the pool and used their locker rooms. Here is a photo of the indoor pool and this is the ONLY photo I have of it… just because I didn’t want to get my camera wet! It is pretty amazing! 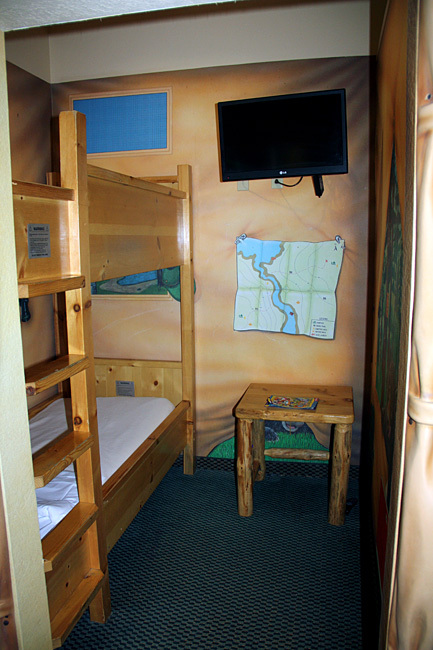 We decided to go a step up from the standard room and got the Kids Camp room, which included a tent for the kids with a bunk bed and their own personal tv! It was SO worth the extra cost, which really was pretty minimal. The rest of the room was a nice size too and I always love it when the bathroom sink and mirror is OUTSIDE the bathroom… The only flaw to the room was that we all agreed the beds weren’t very comfortable. 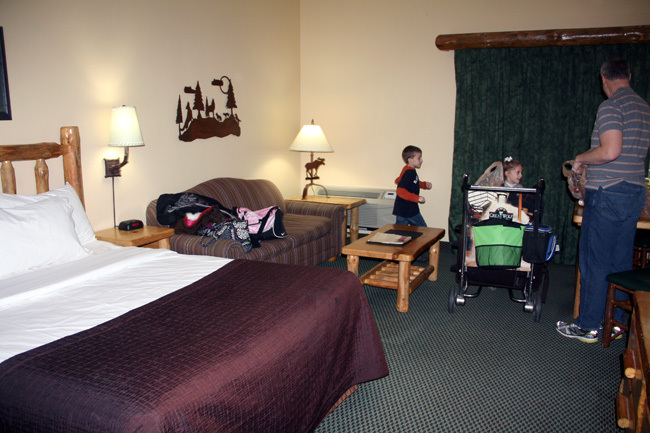 It seemed they really went with a ‘lodge/camp’ feel as the bunk bed didn’t even have ‘fitted’ sheets… it was just a sheet on top of a sort of weird mattress under it… I’m just not even sure how to explain it. BUT, I didn’t wake up with a stiff nick or backache, so they weren’t THAT bad. I’m just being super nick picky. After we swam and checked into our rooms, it was close to dinner time so we headed across the street and ate at T-Rex. 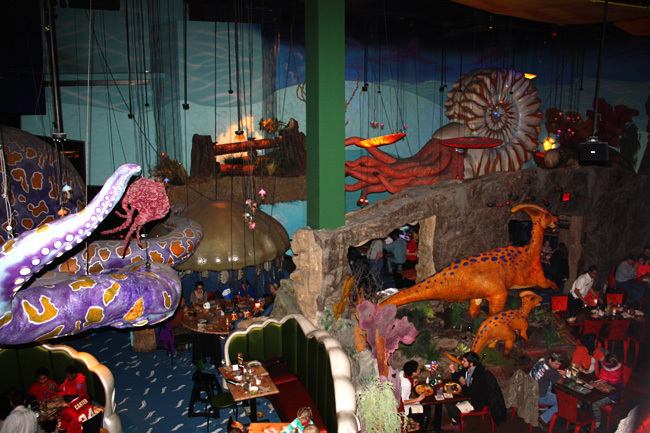 TRex only has two locations and the other one is at Downtown Disney. The kids and I have eaten here before, but they were too little to remember it. 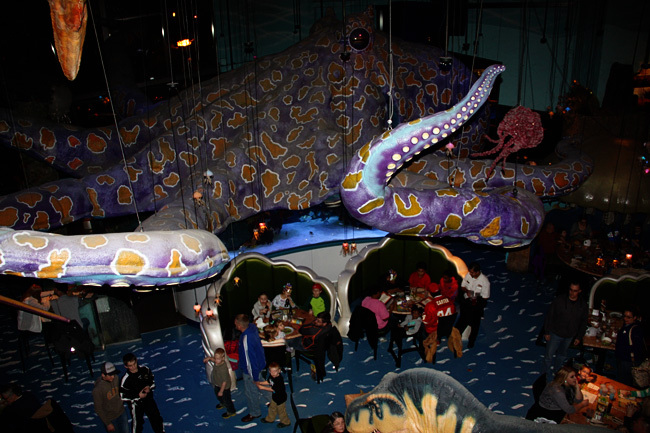 It is a really neat restaurant, we sat in the ice age section and this is a view of the restaurant from below. When I was looking at the menu, I noticed they had cotton candy martiins on the menu! 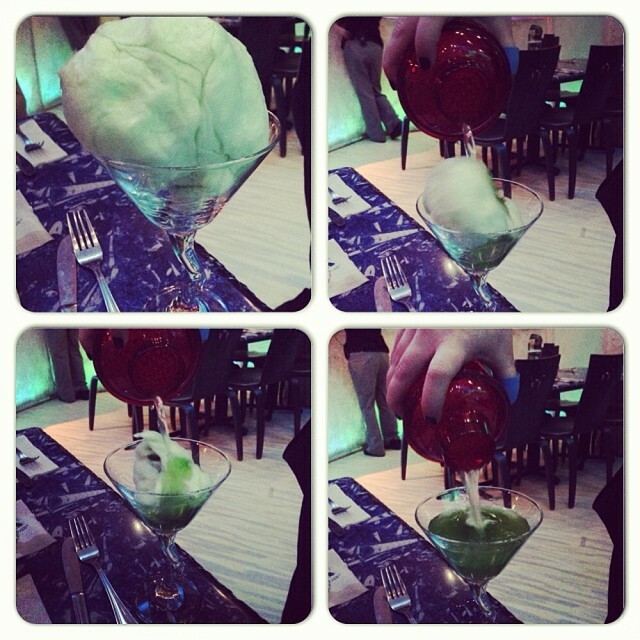 I was so excited when they brought it out and the waitress let me take a photo of how she turned a cup full of cotton candy into a martini! Has anyone had one of these? Delish! She also let me keep the shaker and the shaker had enough for 3 martinis in it! Woah! I shared this photo along with several other photos of our trip on Instagram. If you aren’t already following me on Instragram, click HERE to start! 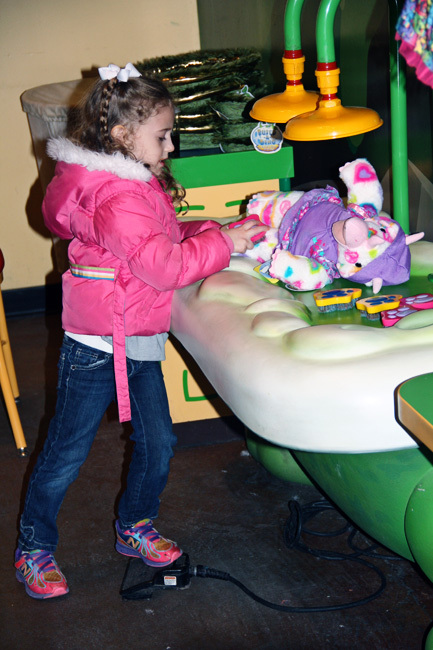 What is nice about T-Rex is that they have several activities for your kids to do while you wait for a table. The place is always crowded and we had a 45 minute wait, so we let the kids Build a Dino. They really enjoyed it! 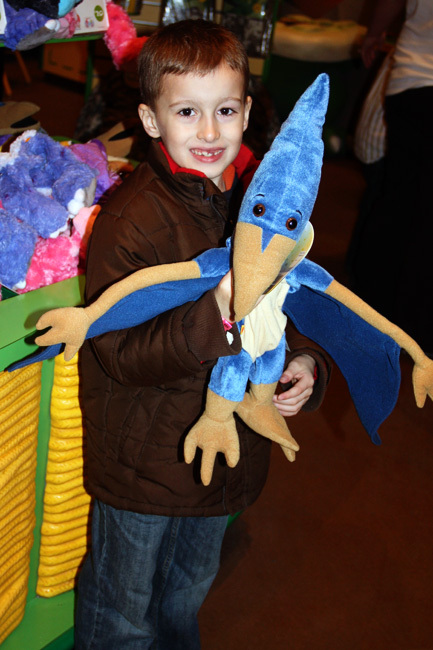 Nathan selected a Pterodactyl, which was my favorite one! Autumn selected a triceratops and had to make sure it was extra clean in its bath.